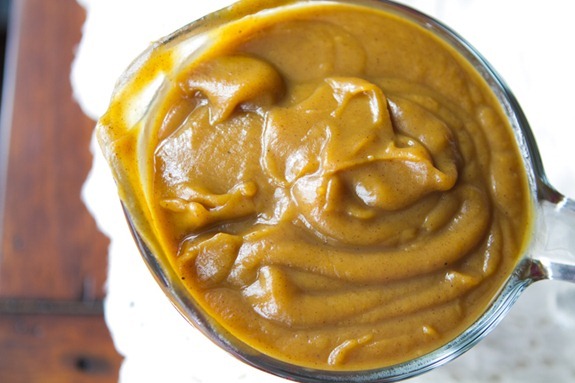 All-Natural Pumpkin Butter From Scratch + Many Ways To Use It! If you’ve been reading this blog for a year or longer, you may know that I’m head over heels for Homemade Pumpkin Butter. Not only is it one of the most popular recipes on the blog, but it’s also a personal favourite. I eagerly make several batches every fall and winter (umm, and apparently during the summer now…). No two batches are ever the same; I love changing it up with different sweeteners and spices depending on my mood. 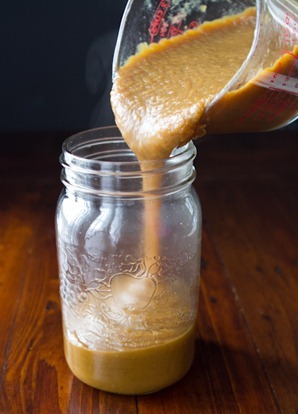 You all seem to love pumpkin butter too – I get so many comments and emails about the recipe! The original recipe uses canned pumpkin which is great for convenience, but I’ve always wanted to try out the recipe using freshly roasted pumpkin. I just knew it was going to rock my world. Well, after that photo I had a lightbulb moment. 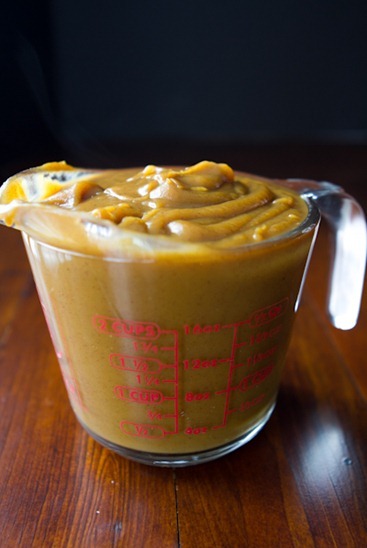 Why not just throw all of the pumpkin butter ingredients straight into the blender and blend it all up? It turned out to be a great idea to use the blender – no need to whisk in any ingredients. Plus, the blender got it super smooth and silky. I also reduced the amount of juice so it only took 10 minutes to cook down on the stove top as compared to 35-45 minutes in the original recipe. I certainly wasn’t complaining! The best tip I can give you when making pumpkin butter on the stove-top is to cover the pot with a lid and prop it open with a wooden spoon. The mixture splatters everywhere while simmering and you definitely need a lid to cover it while still allowing steam to escape. You can also make it in a slow cooker if that floats your boat. Adapted from Homemade Pumpkin Butter. 1. Roast your sugar pumpkins (see this tutorial). Cool for 10 minutes on pan before handling. 2. Add pumpkin flesh (without the skin) in a blender. Add juice and blend until smooth, stopping to push down the pumpkin when necessary. It may take a bit to get it going. 4. Spoon mixture into a medium-sized pot. Cover with lid and prop lid ajar with a wooden spoon. Over medium-high heat, bring mixture to a low boil. Reduce heat to low-medium and cook for about 10 minutes, or until it’s as thick as you want it. 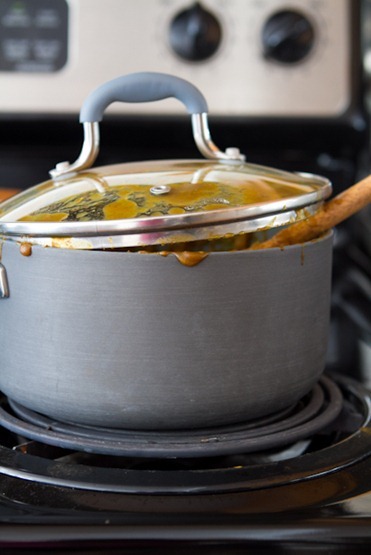 Keep the lid ajar throughout the cooking process – you will find it splatters everywhere so be careful! I like to keep the lid propped up on an angle while I stir the mixture so I don’t get splattered. Remove from heat and stir in vanilla. No matter which version you make, one thing is for sure; your house will smell absolutely wonderful throughout the process. I was JUST thinking I wanted to make my own pumpkin butter after reading an all-too-long ingredient list on a store-bought variety. Can’t wait to try this out! I’m going to slather this all over my bread the next time I make an egg panini! Errrr… and for something vegan maybe I’ll make a sauce to bake tofu in? this, along with our cool (ish) weather tonight on the after dinner walk, just totally got me in the mood for fall. can’t wait to try this recipe. i know what you mean when you say that no 2 batches are the same. that’s the fun part! Our evening walks have been chilly lately too. Tonight not as much but the previous two nights we needed pants and a sweater and we were still chilly. We’re also getting chilly weather, yesterday it really felt not-summerish. Definitely time to pull out the fave soup recipes! I love you and your pumpkin puree! I’ve never had pumpkin butter before and I am so excited to give this a try! 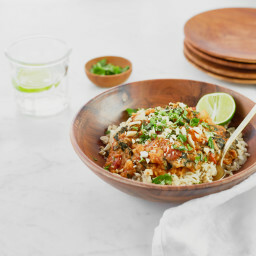 Using the slow cooker is a great idea – I may have to try that and see how it goes!!! Oh.my.gosh that looks so heavenly! The smell in your house while this simmers must be just…insanely good! As I type this comment, I have something pumpkin in the oven baking right now. Can’t get enough of it! This looks so creamy and smooth and awesome! Hey girl – when is your book coming out? I miss your glo bars sooooo much! Thank you Jolene! Should be out early 2014. Sweetie, you-a speak-a my language! I have an amazing (vegan) pumpkin scone recipe that I do every year and I use pumpkin butter as a glaze, but hated using it from a jar — you’re a saint. Now to just hunt down those sugar pumpkins…. pumpkin butter is a great idea used as a glaze. I bet that’s fantastic. I haven’t made pumpkin butter in eons. You have reminded me that I should have it in abundance right now so that I might cover anything that will hold still with it! I am so glad to see pumpkin recipes popping up here :) It makes me want to wear a cozy, thick-knit scarf. Last year I finally mastered slow-cooker pumpkin butter, and as soon as sugar pumpkins start showing up at the local farms this year I’m going to be in pumpkin butter heaven! I spend all year waiting for pumpkins to pop up on my favorite blogs and at the market. I think this officially marks the beginning of the shift into Fall! glad the slow cooker works for you – just curious, how long do you cook it for (and what heat setting)? YES! 3 Pumpkin posts in a row!! I love it! I was visiting my parents last weekend and found a stash of canned pumpkin in their cupboards. I stole them all and have been enjoying pumpkin everything lately! Yes, I’m convinced!!!! :) Thank you for some wonderful ideas! Oh gosh this pumpkin marathon gets better and better! Hahah I’m LOVING the tutorials. Can’t wait to find some sugar pumpkins and get cracking :) Yummmm! Angela that pumpkin butter is just beautiful and I love the gloss it has. I wanted to say that I made your coconut whipped cream and it turned out beautifully (I actually featured and linked back to it in my post today). Mine didn’t come out quite as fluffy, but it was so delicious…way better than any other whipped topping I’ve had before. YUM! I just absolutely LOVE this time of year, the chilly air, needing a sweater, cool nights of sleeping, apple picking and pumpkin pumpkin pumpkin. Yesterday I spent a good hour thinking up a handful of different pumpkin recipes and I am so excited to start making them all. I will definitely have to add pumpkin butter to that list now :) Thanks! Umm yes you’ve definitely convinced me! I still have a jar I bought from a farmer’s market last fall but as soon as I’m done with that I want to try to tackle this! I was wondering if you have the nutrition info for this pumpkin butter recipe? Hey Ashley, there are about 23 cals approx per tbsp. My kids and I JUSt finished up the Pumpkin butter we made last year that was in the freezer. They had apple slices with pumpkin butter every morning for the last two weeks for their breakfast fruit….mmmmmmm!! Need to get some pumpkins soon the make more of it! I’m so happy to hear it freezes well. Ohhhh my gosh! That looks sooo good! Although I am looking forward to fall, I still haven’t been able to let go of summer yet. Yesterday I bought some Ontario grown strawberries from the grocery store and this morning I made your strawberry shortcake stacked pancakes. To die for!!!! I think next up is your stacked pumpkin butter pancakes. BTW could this pumpkin butter be made using canned pumpkin or should I just stick with the older version if using canned? Yes for sure – check out the link in the post. It links to my first version using canned pumpkin. It was also fantastic! Looks great! Any savory recipe ideas to use with the purée? Without the vanilla of course! Always love your ideas and blog! Pumpkin butter latte. I’ve gotta tell my boyfriend’s mom about that one. “Have you convinced us yet?” Heck yes! I think we all want to call in sick today and make this… Especially for the smell alone. :-) I just bought seven cans of pumpkin ( Pba free too!) and Fall is by far my favorite season, and it’s only just beginning. Yay and I can’t wait to try your pumpkin butter! I made this all fall and winter last year. I LOVED it. During my long runs I’d think about coming home to a toasted bagel with homemade pumpkin butter … nothing better! Can’t wait to make it again this year. 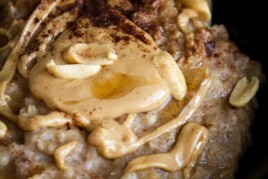 I just made the Maple-Cinnamon Almond Butter Monday night, so I’ll get through that first. I am so excited to make this for my toddler! He loves almond butter and jelly sandwiches so I am sure he will love this! You had me convinced at the title – it’s finally fall, and high time for some pumpkin butter! I am looking forward to making this today, thanks for the recipe! 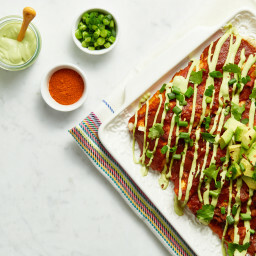 Thanks for the recipe – I can’t wait to get started on making this! This gets me soooo excited for fall. Anything pumpkin is fair game! 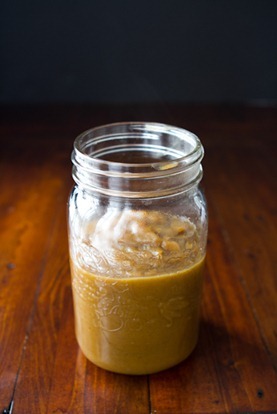 Great idea to try making my own instead of purchasing the jarred stuff–this looks delicious! Oh wow. This looks incredible! I absolutely love the smell of pumpkin cooking with all those spices. This is a must make this fall. Thank you for posting! YAY! More things to use my sugar pumpkins for! If only we could can pumpkin.. I know! Im bummed they don’t recommend canning it. I can honestly say that there is not ONE day that I go without pumpkin. My all time fav veg! I’m sad to say that in Australia we don’t have sugar pumpkin :( but kent pumpkin is very sweet so perhaps I’ll use that. I’m so new to this pumpkin thing. Last year the only thing I had was pumpkin pie, but so far this year I’ve had pumpkin VOO and pumpkin smoothies. 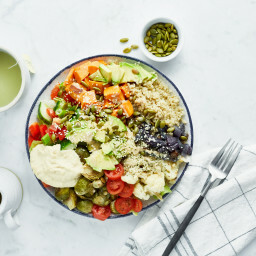 We use the Canadian Food Guide for a few things to reference and one thing it recommends is that we get one dark green vegetable a day and one orange vegetable a day. Between your Green Monsters and all your pumpkin recipes, I think you’ve got me covered lol! I know what you mean – before I started reading blogs I NEVER ate pumpkin. Then I got hooked and it was all over. You didn’t even have to convince me of anything once I saw the title and pictures! I love Pumpkin and making Pumpkin Butter sounds divine. Thanks for sharing the recipe! I love all your food. I was salivating while reading this. i have never heard heard of pumkin butter (i’ve only been following your blog for a month and a half) but it sounds insanely good! i love that you include ways to use it because that is suuuper helpful! thank you!! Just made the pumpkin butter…. 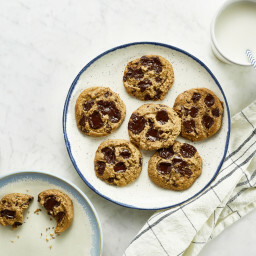 I had never heard of it before but had a recipe that called for it (couldnt find it in any of our stores) so I googled it and found you :) It was super easy to make and taste great. I’m making pumpkin cheesecakes brownies (fattening I know)…. thanks for the awesome recipe! I’ve read that the USDA does not recommend home-canning mashed squash because the variation in thickness, acidity, and water levels cannot guarantee a consistent calculation for safe canning. However, I think if you sanitize the jars and lids like you would for canning, the jars which last unopened for a few months in the fridge! I’m so glad I stumbled upon this post!! I made both your pumpkin and apple butter recipes last year and they were fabulous! I just opened a can of trader joes pumpkin butter but it’s definatly not as good as homemade. I have got to make this one as soon as my garden pumpkins come in! YUM!! I’m going to add this to my list of reasons of why I should own a Vitamix! Aw that’s so great to hear! My mom and I can’t stop making all of your recipes! Is there any way to make it sugar-free? Maybe use pureed apples instead of apple juice and stevia? I love the idea of a natural Pumpkin butter. IT is one of the best foods but always loaded with sugar. I”m looking forward to making this recipe! Just finished making the pumpkin butter this morning. OMG!! It smells wonderful. I’m going to add this to pancakes this morning. Thank you Angela. Love the recipes!! This pumpkin butter looks AMAZING! I’m so ready for fall so I have an excuse to spread pumpkin butter over everything! Just made this deliciousness this morning!! Out of this world good! I just had a baby and am excited at how good the puréed sugar pumpkin was all by itself! Baby will love it!! Love your blog! Glad you love it Amy!! Angela, I just finished making this pumpkin butter and OMG it’s delicious! I’ve never even tasted it before until this evening and I also haven’t ever cooked with fresh pumpkin before either….I’ve always used the canned. I can honestly say that I won’t be using canned from now on if I can help it. Not only did two small pumpkins yield 4-5 cups (just like your recipe says it should), every step of the process went perfectly smoothly – because I followed your instructions to the T.
My family is going to totally love receiving a small jar for Thanksgiving (I’m making some for everyone) and I’m also going to link to this post on my blog when I write about the awesome pumpkin butter! Love, love, love this! Thank you so kuch for sharing it with us. It’s spring here in Canberra but I still have garden pumpkins squirrelled away in the pantry. I tried this recipe over the weekend and oh my goodness – this is incredible. We’ve put it on toast, mixed it into whipped cream and made chocolate pudding-pumpkin parfaits, and mixed it into oatmeal. I think this stuff would go great on just about everything. Thanks! Iabsolutely love your blog! Where can i find sugar pumpkins in the summer? I noticed you said you have started making pumpkin butter in the summer. Also, are sugar pumpkins any different from the small pumpkins you can find in the fall -through i just bought some to decorate the outside of my apartment. Hey Melinda, The sugar pumpkins arrived a bit early this year (late august) – they are also called pie pumpkins or pumpkin pie squash. Be sure not to use the mini pumpkin gourds as you aren’t supposed to eat those. Goodluck! I make pumpkin apple butter with my Mother every year and give jar out to relatives and friends for the holidays. We usually use canned pumpkin and a whole bag of apples but I will have to try it this way – my mouth is just watering looking at the photos. Hi! I love your blog. I adapted this recipe and used it on my blog. I did credit and link back to you, I just wanted to let you know! Did you try it in the slow cooker yet? Would it be a similar process to making apple butter in the slow cooker? Thanks! Love your recipes! I havent tried it yet but I cant see why it would work! Angela, is there anything that you could recommend using in place of the apple cider/juice? Stupid question…but can you can this like any jelly or preserve or apple butter? Would it be good? Hi Tammy, Sadly, it’s not recommended to preserve pumpkin butter. I linked to the article in my original post if you want to check it out. Thank you for this. I’m on my third batch. And I’ve learned lots of fun stuff. 1. The little baby pie pumpkins work well too (and easier to come across in my neck of the woods.) You need like 4 of them per batch. And it’s easier to cut those suckers in half, and then remove the stem. 2. Molasses substitute for part of the maple syrup makes it less sweet. 3. Ginger is an awesome addition. 5. You tell people you are making pumpkin butter and they get all jealous and want you to send them some. Be prepared if you are going to talk about it. And oh, if you’re super pumpkin fan, there’s a recipe for pumpkin gnocchi with apples and sage that is the yum. Incredible. I just used this as the filling for cinnamon buns. Seriously amazing!! Have you tried canning it? Just saw the message above about canning. Rats. This looks amazing! Which do you prefer taste-wise, this pumpkin butter from scratch, or the pumpkin butter using canned pumpkin puree? They both look amazing! To be honest they are both amazing! You can’t go wrong with either. If I have more time I make it from scratch but the other is good in a pinch. I love this and have made it many times. This batch didn’t produce the glossy finish I usually get. what can I add or do to improve on that? Im not sure Lisa, did you make any changes? I made two batches of your pumpkin butter and then the third batch I spread on to trays and dehydrated into pumpkin butter leather! Outstanding! Thankss for the great recipe! My dehydrater is a very old hand made wooden one with metal tray, no timer, and no temp settings and to turn it on or off you plug or unplug it! LOL! But it works! I cut parchment paper to fit the trays and tried to spread it evenly and ran it over night. It was a bit long cuz the leather cracked and pulled apart but the taste is wonder. I only have pie pumpkins I grew and I pressure cooked them until they were soft scraped the pulp into my kitchen aide blender and then added the rest of the ingredients purreed it up and spread it out. Mine comes out so thick I don’t have to cook it down! I had to add that I did this with a “cornfield pumpkin” that I grew in my garden. I had to cut it into sections to roast it and it made ~3x’s the amount or so. 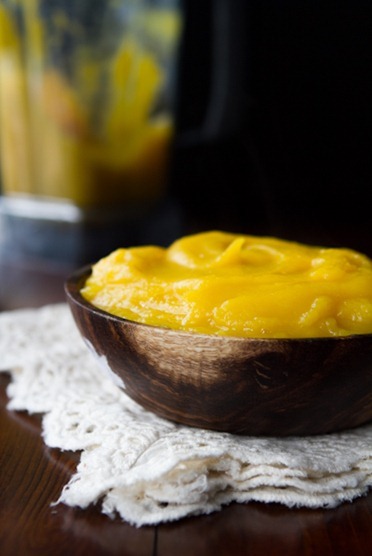 The puree blended up to about 5-6 cups each time and did this 3 times. I added the recommended amounts of additional ingredients in your recipe and did this in 3 batches essentially. now I have a ton of pumpkin butter (some in the refrigerator, some in the freezer). I did roast the seeds as well and I’m glad to have used the pumpkin. I just wanted to add that you don’t have to use pie or sugar pumpkins. You CAN use the larger carving pumpkins and when everything is pureed anyway, it doesn’t matter if it was stringier than the pie pumpkin. Of course, it was more work to cut it up into pieces and since it was bigger it took longer to process everything. Still tastes excellent, though! Will this spoil if I don’t store it in the refrigerator? I want to send some across county. It should be fine – I would think since most nut butters are fine at room temp for at least a month. Can this be frozen, or what’s the shelf life I’m having a October wedding and would love to make this for favors need to make them a few months in advance lol. I’ve heard you can freeze pumpkin butter, but Im not sure for how long it would last. Goodluck! 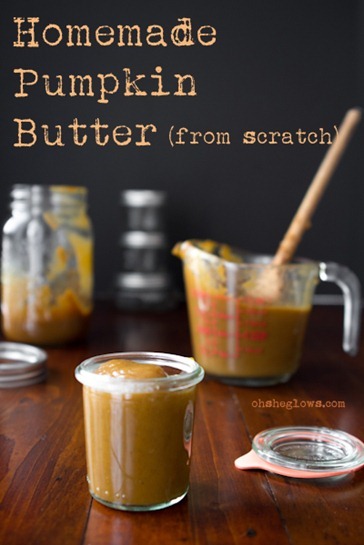 If I want to can pumpkin butter,…. will it can like applebutter? or do I have to use a pressure cooker? which I have never used before. Please I would love an answer from someone who knows and has done this before. I was hoping to find a recipe to can pumpkin butter, I grew pumpkins and amazingly the smallest one was over 35lbs. So I have pumpkin coming out my ears and we recently took a trip to the Smoky Mts. and found pumpkin butter at several of the roadside stores, and decided it would be a great way to use some of the pumpkin that I have canned, Do you have any ideas on how to make a larger batch so that the butter can be canned and stored over a longer period of time? The USDA warns against home canning of pumpkin puree & pumpkin butter. 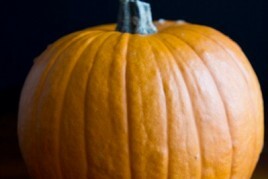 Pumpkin is not acidic enough, nor does the puree or butter contain enough water. Botulism spores are able to survive processing in a home pressure canner, then reproduce anaerobically (without air, in sealed container like a Mason jar). The result is that botulism toxin could develop in home canned pumpkin butter. Instead, it can be frozen in small batches. I made a batch, but since we are empty nesters, I’m going to freeze some of it and hopefully use it when the kids and grand kids show up over the holidays. Thanks for the recipe! I did read through the comments, but I didn’t find an answer to my question. Would this still taste good without the sugar added (apple juice, sucanat, maple syrup and lemon juice)? I am doing a 21 day sugar detox but would love to try this in the slow cooker! Is it possible to replace the Sucanat with something else? Say.. coconut nectar sugar? Or will it not come out the same? I really want to try this recipe! Hey Valerie, Yes you can sub any dry sugar you prefer :) hope this helps! Great recipe. Can this be canned? If I wanted to can this (mason jars), would I need to add anything for it to be shelf stable for a while? Hey Tasha, See my link at the bottom of the recipe – pumpkin butter isn’t recommended for canning. I do find it lasts for up to 3-4 wks in the fridge though. Where’s the butter in the pumpkin butter? Made this today and it turned out beautifully. Thank you. Pumpkin butter sounds so good! I have never made it before, but i can already imagine everything I would put it on! Having made a different recipe of pumpkin butter in the past, I must say this one was spot on. The right amount of sweetness and the perfect texture. Thanks for sharing!!!! If I want to can the pumpkin butter to preserve do I follow the basic canning process of boiling empty cans, adding pumpkin butter, then boiling filled cans to vacuum seal? Can you can this stuff? Any tips on how? Apple butter was my favourite when I was a kid, but I haven’t had pumpkin butter! It sounds like an ideal fall treat! I am pretty sure I have pumpkin butter recipes that CAN be CANNED–mine I think call for PECTIN but I am not sure if this is needed for canning or just for thickening. For ANY canning info either call BALL Canning Jars–I think they have an 800 number—or call your County Extension Office. IT might take a long process time to get the thick butter up to the proper temp throughout. But you can probably also look this up on-line; my recipes are older but I am sure the basic ingredients etc have not changed. If you decide to go with a pectin recipe stock up NOW as this is hard to find other times of the year. It does keep. We like ours on pumpkin muffins and with cream cheese and on crackers and over vanilla or other ice cream and –well–pretty much on anything! The USDA does not recommend home canning for pumpkin butter or pumpkin puree, due to the risk of botulism. I really like your blog. Have stopped by many times for tid bits. Which have always been great and i thank you for you time and dedication. As far as the reply dissing you about only blogging 3 times a week imstead of 5. Seriously! Wow I am also doing a cook book/home health/cleaning book just for my family so old family recipes amd remedys don’t get lost. Well let me say you are AMAZING!!!! I know how challenging it is and you still manage to blog 3 times a week. Gosh you could have closed her down completely until you completed your cook book. Some people….. I said it before you are amazing and if you didn’t truly care about your followers it could have played out very different. So THANK YOU!!!! Thank you Pamela, I greatly appreciate your kind words. Good luck with your own book! Im sure it will be great. Fantastic recipe! Made this a few weeks ago and loved it! Making more tomorrow! I’ve never made anything using pumpkin before (other than the seeds). So good! I just made this today for my teenage daughter who loves all things pumpkin. I made it in the slow cooker. One hour on high with the lid on so everything heats up and then another hour on high with a chopstick propped under the lid so it could reduce. I stirred it 2-3 times in the second hour. Seems to work. Have you ever made or thought of creating recipes without toxic sugar? Guess I should have added that I’m on a health restricted diet and can’t have any starches, sugar, artificial sweeteners, grains, etc… I’m always on the lookout for great tasting recipes since I have to make everything I eat. No processed foods. I also like to grow my own produce if at all possible, because then I know it’s free of pesticides and the like. Can I can this? I’d love to process a bunch of it and give it away as Christmas gifts! Thank you! NO—that’s not recommended by the USDA, because botulism spores can survive home pressure canners. Pumpkin puree & pumpkin butter are not acidic enough, nor do they have enough water content to be safely processed in a home canner. I am in the process of making this. I steamed my pumpkin instead of roasting it. But the problem is… I keep eating it straight out of the pot! I don’t know if there will be any left by the time it’s supposed to be ready. Love all of the recipes you have with sugar pumpkins. I have many ready for baking growing in my backyard. I was wondering have you tried preserving the pumpkin butter? It would be nice to give out as Christmas gifts. I am just starting to get into making homemade jams from our fig tree and pressure sealed the jam under boiling water / 7 min. Would the same process work for this? I’m so happy to see a recipe with Sucanat! can you “can ” this butter? it would be great to give as christmas gifts! No—too risky due to botulism spores that can survive home pressure canners. Freeze it instead. Wonderful, just wonderful. I tried with honey in place of syrup, turned out great. Smells like Heavon. Thank you! It’s awesome, and the best part is the 2 minutes hands-on time if you have puree already! I love this! I substituted the maple syrup with honey and a bit of agave. My son is gobbling it up on everything. Toast, ice cream, as a apple dip, by itself. I will be making this again. When I saw pie pumpkins in the store after years of looking for them i knew what I had to do. minimalist baker recommended your pumpkin pie butter for her pumpkin cinnamon rolls, and i took her up on that suggestion….i made a smaller amount of your recipe—it was delish!…i’m going to make another batch of it to put in my coffee or on oatmeal—or just eat it with a spoon! My apologies for asking a question on an older post, but I only just came across it. This was linked on a post by Minimalist Baker. In Australia we don’t stock sugar pumpkins. Can you recommend some alternatives? Currently, our supermarkets stock: butternut, kent, and jarrahdale (grey skin) pumpkins. Will any of these work? Hey Jes, I’m not familiar with Kent or Jarrahdale, but I think butternut would be lovely! How do i print the recipe without printing 39 pages? Hey Sue, My apologies this recipe uses our old recipe system (Recipage), which we no longer use. My advice would be to copy and paste the recipe into a word doc and print it that way. Hope this helps! when I came back to computer to write down recipe, I was directed to your site. Not a vegan, and don’t plan to become one anytime soon, but I have written down your recipe and will try it as soon as I can get out to buy a pumpkin to roast. Thanks for the recipe. Hi Jiovanna, I can’t thank you enough for your comment! I’m thrilled that you’ve discovered my blog, and that you’re experimenting with the recipes. How inspiring! All my best. Hi! This looks so yummy! I was wondering if it’s possible to use canned pumpkin instead of fresh in the recipe. I know fresh is optimal but if I make this and I’m pressed for time, I’m just wondering if you think it will work! Hi Danielle, Yes absolutely! 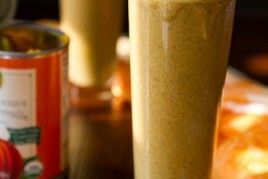 My original recipe linked in the post uses canned pumpkin and it’s a fantastic option too: https://ohsheglows.com/2010/10/05/happy-thanksgiving-homemade-pumpkin-butter/ :) Hope this helps! This is delicious. I made it with a sugar pumpkin I grew in my backyard. 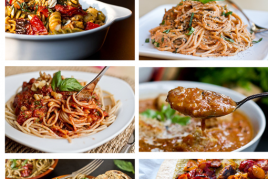 Next post: 7 Favourite Vegan Recipes From Family Fresh Cooking!